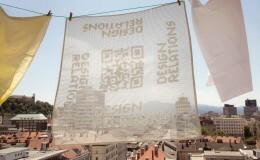 Niko Kralj is the most significant Slovene designer of all periods. His role can be compared to the Aalto's in Finland or the Eameses in USA. Through their modernity Kralj's chairs have come to represent a key part of the Slovenian cultural identity. 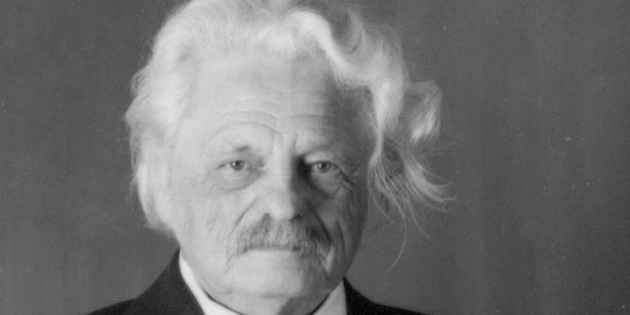 Niko Kralj, a pioneer in Slovene industrial design. Photo source: MAO. Nearly every Slovenian has encountered objects designed by Kralj – whether in kindergarten or school, in waiting rooms at medical centres or municipal offices, at work or at home, inside or out on the balcony. 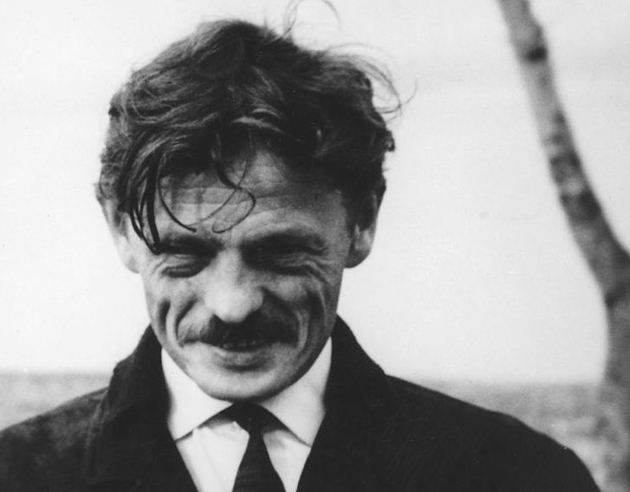 During the Vienna Design Week (10/3/-10/15/2012) you can visit the exhibition „Niko Kralj: The Unknown Famous Designer“ in Architekturzentrum Wien, created by the Museum of Architecture and Design (MAO) in Ljubljana. For sixty years Niko Kralj (born 1920) has been the central figure in Slovene design, but for the first time, all of his most important products, prototypes, and concepts are on display, and it is possible to correlate them with the ideas expressed in his articles, talks, product descriptions, and other documents from his archive. The authors of the exhibition are Špela Šubic, the MAO’s curator for industrial design, and Barbara Predan, who lectures on the development and theory of design at the Academy of Fine Arts and Design in Ljubljana. From the exhibition's display - „Niko Kralj: The Unknown Famous Designer“. Photo: MAO. This exhibition showcases how Niko Kralj ceaselessly strived for improvements that would provide ordinary people with better-quality and more affordable products in their everyday lives. He was persistent in the pursuit of his goals, although, his greatness rises from the point he was living in an economic system that did not encourage competitiveness or innovation, hence – these were not easily realized! For this reason too, the MAO Ljubljana gave his collection pride of place, because his works are the key chapters in the history of contemporary Slovene design and the symbol of its modernity. The fact that Kralj learned carpentry in his father’s workshop was very important for his professional career and later influenced his advocacy, both as a designer and a teacher, of shop work and direct contact with materials. 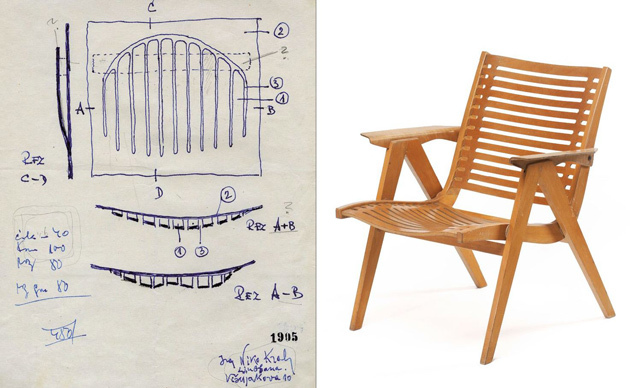 The most known Kralj’s work is his series of wooden chairs – the Rex, the Lupina & the 4455. Photo: MAO. The most known Kralj’s work is his series of wooden chairs – the Rex, the Lupina, the 4455 – and many other products from the Stol Factory, as well as his various furniture systems for work spaces and homes, have become part of Slovenian history and collective consciousness. 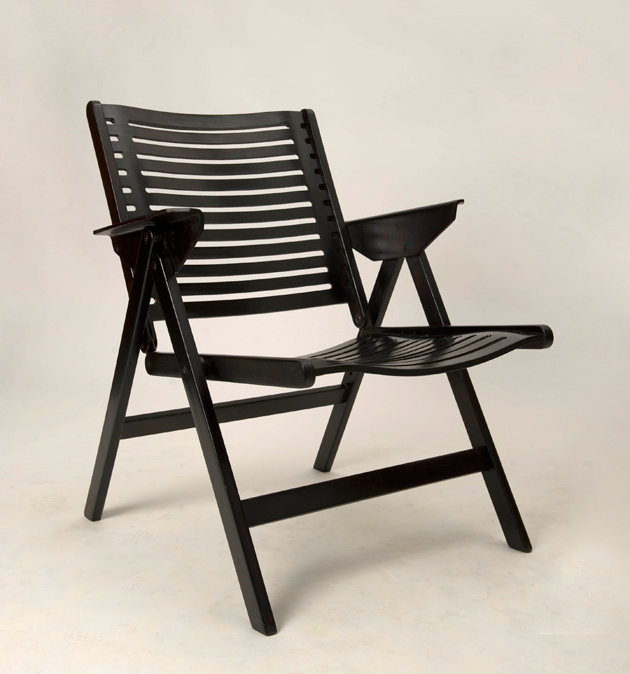 The expansion of the Slovene furniture industry in the early 1950’s offered the self-confident designer a suitable challenge for the start of his career at the Stol Factory Bentwood Furniture. 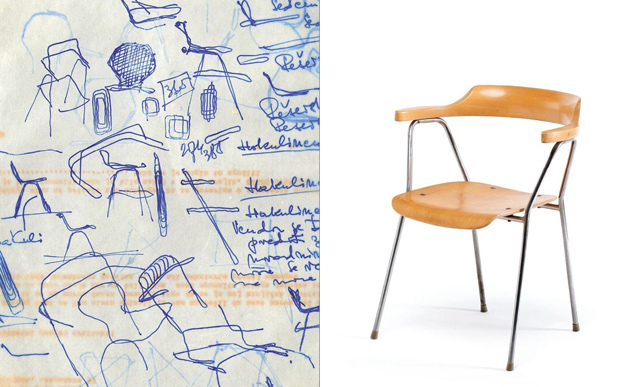 Drawings of chairs similar to the 4455 chair (MAO); with the 4455 chair, produced by the Stol Factory, 1955 (MAO). And, it is truly amazing that, in the first year of his professional career, Kralj managed to set two historic milestones in Slovene design. In the autumn of 1952 he prepared the programme and organized the planning work for the first factory-based design and development office, not only in Slovenia but in the whole of Yugoslavia, and that same year he presented the prototype for the first Rex chair. Kralj developed the idea of plywood moulding and perforation further than the Eameses, by using it in a much more radical way. He took plywood that had been moulded in one direction and perforated it so densely with parallel cuts that it could also be moulded in a second direction. The form of the secondary moulding was determined and arrested by the two end laths using a shaped groove. This is how the basic shell of the Rex 120 chair was created. Given the results of his work, it is not surprising that the factory management allowed him, not only to take part in numerous competitions, but also, in 1957, to go to Sweden for a six-month advanced study programme. Ultimately, the success and the credit must be ascribed to both sides. 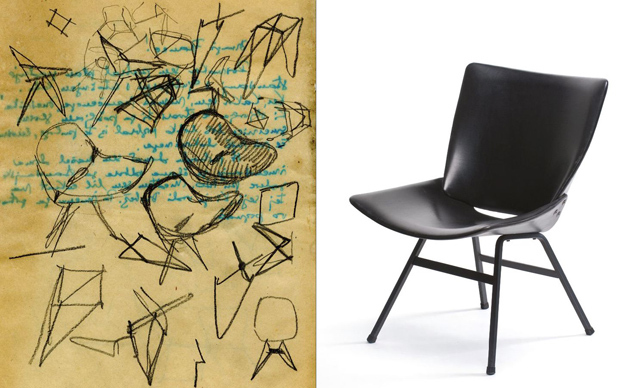 Sketches for shelllike seats and frames (MAO); with the Lupina (“Shell”) chair, produced by the Stol Factory, ca. 1955–1959 (MAO). 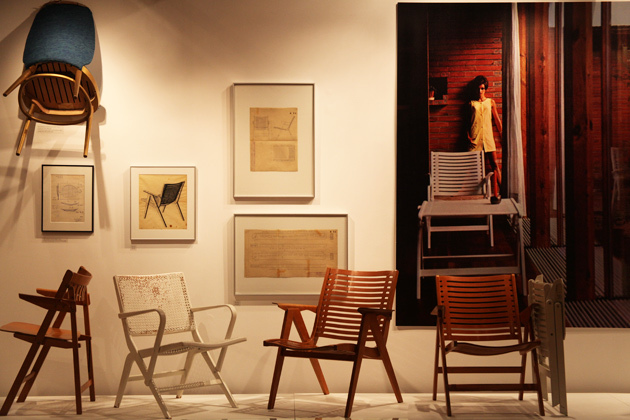 The strong influence of Swedish design is evident in many of the chairs Kralj realized as well as in his models for chairs of bent laminated wood that never reached the production stage. During his time in Sweden, he became familiar with the a number of professionals in the design field. 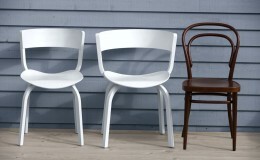 Slovene design subsequently received a major endorsement from the Swedish designer and important theorist Erik Berglund. And two years after Kralj’s visit to Sweden, in an article for the newspaper Expressen, Berglund praised the Yugoslav furniture industry and Kralj’s work in particular. Although Kralj turned down the offer of a partnership with Ilmari Tapiovaara and Olof Pira – because he wanted to keep his full-time job at the Stol factory – he maintained personal and professional ties with his Scandinavian colleagues. Rex chair (Stol) by Niko Kralj. Photo: Marjan Laznik. He always advocated greater social awareness and the principle that good design should be accessible to everyone, which he tried to realize in his works as well. The fact that, after fifty years, the Rex chair has become a cherished object of desire is part of the new story of Slovene design and represents a well-deserved triumph for the designer. Niko Kralj. Photo: Janez Kalisnik. — *The exhibition at Architekturzentrum Wien is an adaptation of the extensive retrospective overview of Kralj’s work and design career that was displayed under title Niko Kralj: Unknown Known Designer at the Museum of Architecture and Design in the end of 2011 and in the beginning of 2012.